The Phantom Knights of Break Sword is a fantastic monster for any Deck that can field a Rank 3 Xyz Monster, but it’s also the lynchpin Xyz Monster for the Phantom Knights Deck. The Phantom Knights are a new theme where every card has two abilities: one that you play while the card is in your hand or on the field, and one that you can use while the card is in your Graveyard! Any discussion of the Phantom Knights needs to start with their Level 3 monsters. Rank 3 Xyz Summons are the backbone of the strategy, and the Level 3 Phantom Knights provide both Summoning speed and card searching power to make sure you start the Duel off on the right foot. As discussed yesterday, The Phantom Knights of Silent Boots can be Special Summoned from your hand if you control any “The Phantom Knights” monster – even another copy of Silent Boots! It can also be banished from your Graveyard to add any “Phantom Knights” Spell/Trap Card from your Deck to your hand. The distinction between “The Phantom Knights” and “Phantom Knights” may seem minor at first, but it is an important distinction to keep in mind as you take a look at The Phantom Knights of Ancient Cloak. The Phantom Knights of Ancient Cloak can shift itself to Defense Position to pump up any of your DARK monsters by 800 ATK and DEF until the end of your opponent’s turn. This can even be used on itself in a bind, giving you an 1800 DEF wall during your opponent’s turn, but the best uses for this ability all involve making one of your Extra Deck monsters even bigger for a turn. If The Phantom Knights of Ancient Cloak is in your Graveyard, you can banish it to add 1 “The Phantom Knights” card from your Deck to your hand. This is why the distinction between “The Phantom Knights” and “Phantom Knights” is important: “The Phantom Knights” are all monsters, except for The Phantom Knights of Shadow Veil from The New Challengers. That means that Ancient Cloak isn’t going to be searching out your Trap Cards, you need Silent Boots for that. The Phantom Knights of Ragged Gloves has the all-important “+1000 ATK to a DARK Xyz Monster” discussed yesterday, but it can also be banished to send any “Phantom Knights” card from your Deck to the Graveyard. That includes all the Spell/Trap Cards, which is important because each of them also has an effect that can be played from the Graveyard! The Trap Cards, in particular, are vital to a Phantom Knights Deck. Phantom Knights’ Wing and Phantom Knights’ Sword have effects that buff up the ATK and DEF of a monster on the field and prevent them from being destroyed once either that turn (Wing) or whenever (Sword). Phantom Knights’ Fog Blade acts like a turbocharged Fiendish Chain, negating the effects of any Effect Monster on the field and preventing it from being chosen as an attack target. The latter ability may seem like a weakness, but you’re more often than not going to destroy the targeted enemy monster with The Phantom Knights of Break Sword anyways meaning that what the latter ability is actually useful for is defending yourself by using Fog Blade on a monster like Card Trooper or Dante, Traveler of the Burning Abyss that has an effect with a cost to send cards from the Deck to the Graveyard. You’ll want to play all 3 of these Trap Cards because each of them can be banished from your Graveyard any time during either player’s turn (except the Damage Step of course) to revive one of your Phantom Knights! You can only use the revival effect of each card once per turn, so having access to all 3 is very important, especially when you’re trying to execute the second part of your strategy: the super-powered Rank 4 monster! As you know from yesterday, your ideal scenario is to Summon The Phantom Knights of Break Sword, destroy something with it and attack, and then protect it during your opponent’s turn with the Phantom Knights’ Trap Cards. Then, on your turn, you’ll destroy Break Sword itself along with another opponent’s card and use Break Sword’s other ability to Summon back The Phantom Knights of Ragged Gloves and another Level 3 Phantom Knight as Level 4 monsters. You’re restricted to only Summoning DARK monsters for the rest of the turn when you do that, so you’ll want to make the best Rank 4 DARK Xyz Summon you can. Evilswarm Thanatos and Master Key Beetle are both great picks, but with a third Level 4 monster you can go for a 3750 ATK Evilswarm Ouroboros or get 1 turn of effect immunity out of a 4000 ATK Number 86 Rhongomyniad. If you can get enough cards into your Graveyard or hold back your Normal Summon for something like Armageddon Knight, you might even be able to pull off a 4000 ATK Rhongomyniad with 4 or 5 Xyz Materials, locking up the Duel right there! But no matter what the plan is, you’re probably going to need The Phantom Knights of Fragile Armor to pull it off. 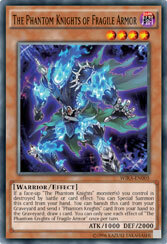 If one of “The Phantom Knights” is destroyed you can Special Summon The Phantom Knights of Fragile Armor from your hand. It’s a Level 4 DARK Warrior, so it immediately becomes the 3rd Xyz Material for your monster. Alternatively, if you Summoned The Phantom Knights of Ancient Cloak along with Ragged Gloves, you could just go for a 2 Material Xyz Summon and used Ancient Cloak to power it up even further. With The Phantom Knights of Fragile Armor in your Graveyard, you can banish it and send another “Phantom Knights” card from your hand to the Graveyard to draw a card, setting yourself up for even more potential Summons! The Phantom Knights are unique among Graveyard-focused Decks for their combination of power, precision, and simplicity. Use the Graveyard effects of your monsters as Ignition Effects during your Main Phase, and play your Trap Effects from your Graveyard whenever you want! No degree in simultaneous Trigger Effect Chain building required. Wing Raiders launches on February 12th.